JAPANESE WEIGH DIPLOMACY VS. WAR WITH U.S.
On this date in 1941, in an Imperial Conference in Tokyo, Japa­nese offi­cials con­cluded that if diplo­matic mea­sures could not reverse the U.S. policy of em­bar­going the export of various stra­te­gic raw mate­rials (e.g., oil, iron ore, rubber, and scrap steel) to Japan by early Octo­ber, then the govern­ment and mili­tary would imple­ment the “South­ern Plan,” or “South­ern Advance”—attacking Brit­ish and Amer­i­can bases in the Asia Paci­fic region and securing the oil-rich Dutch East Indies (today’s Indo­nesia) for the nation. (The “South­ern Advance” became national policy in July 1940 when both the power­ful army and navy leader­ship settled their stra­tegic differ­ences over poten­tial areas of expan­sion. Ger­many’s inva­sion of France in May 1940 and the Soviet Union in June 1941 strength­ened Japan’s flexi­bil­ity when expanding to the south.) On Novem­ber 5, 1941, in another Impe­rial Con­fer­ence, this one with Emperor Hiro­hito in atten­dance, Japa­nese officials were told by the hawk­ish Gen. Hideki Tōjō—war minis­ter, home minis­ter, and since October 17 prime minis­ter—that Japan’s 73 million peo­ple must be pre­pared to go to war with the West, with the time for mili­tary action tenta­tively set for Decem­ber 1, if diplo­macy with the U.S. and the Euro­pean colo­nial powers failed to im­prove rela­tions and reverse trade restric­tions, which the govern­ment labeled acts of aggres­sion. (Imported oil made up about 80 per­cent of domes­tic con­sump­tion, with­out which Japan’s econ­o­my, let alone its bru­tal expan­sion in China, would come to a halt.) Two weeks later, on Novem­ber 18, the Japa­nese Diet (parlia­ment) approved a reso­lu­tion of hos­til­ity against the U.S. Japan’s attacks on Pearl Harbor, the Brit­ish crown colony of Hong Kong, British Malaya, the Dutch East Indies, and the U.S. Philip­pines and Wake and Guam islands on Decem­ber 7 and 8, 1941, drew the U.S. and its Euro­pean allies into an ex­hausting, bru­tal, and costly Asia Paci­fic war whose out­come in Japan’s favor, in the view of Pearl Harbor archi­tect Adm. Isoroku Yama­moto, was highly prob­lem­atic. Only after the destruc­tion of the Japa­nese cities of Hiro­shima and Naga­saki—combined with the Soviet Union’s decla­ra­tion of war against Japan—pro­vided ir­refut­able evi­dence of a no-win situ­a­tion for Japan were Hiro­hito and the Supreme War Council pushed over the edge to sue for peace in mid-August 1945. 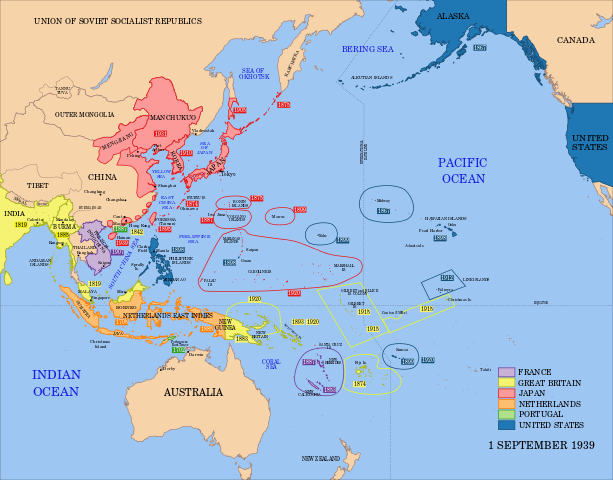 Above: Political map of Japanese, European, and U.S. pos­ses­sions in the Asia Pacific region on the eve of the Pacific War, Septem­ber 1, 1939. Japa­nese con­trol in China was tenuous. 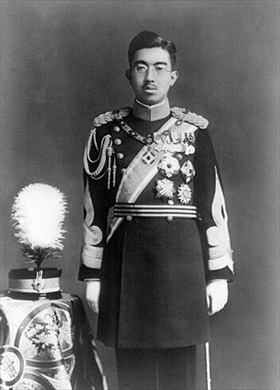 Left: Emperor Hirohito (1926–1989) in dress uniform, 1935. On Novem­ber 2, 1941, Hiro­hito (post­humously referred to as Em­peror Shōwa) gave his con­sent for his coun­try to wage war against the United States. The next day the em­peror was briefed in detail on the pro­posed Pearl Har­bor attack. Two days later, on Novem­ber 5, 1941, Hiro­hito approved the opera­tions plan for the war and con­tinued to hold meetings with the mili­tary chiefs and Army Minis­ter/Prime Minis­ter Hideki Tōjō until the end of the month. On Decem­ber 1, another con­fer­ence finally sanc­tioned the war against the United States, Great Britain, and the Netherlands. Right: Gen. Hideki Tōjō (1884–1948) in mili­tary uni­form. 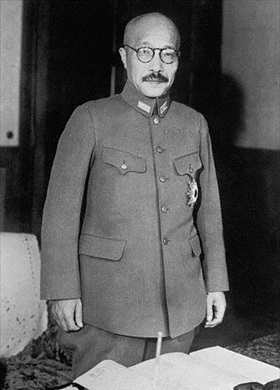 On July 22, 1940, Tōjō was appointed Japa­nese Army Minis­ter. During most of the Paci­fic War, from Octo­ber 17, 1941, to July 22, 1944, he served as prime minis­ter as well. In that capa­city he was directly respon­sible for the attack on Pearl Harbor. After the war Tōjō was arrested, sen­tenced to death for war crimes by the Inter­na­tional Mili­tary Tri­bunal for the Far East, and was hanged on December 23, 1948. 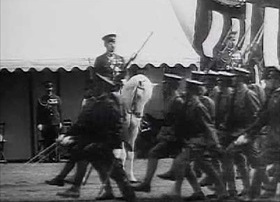 Left: Soldiers parading before Shōwa Emperor Hiro­hito. Prior to and during World War II, Hiro­hito was shown in photos and news­reels riding Shira­yuki (White Snow), his beau­ti­ful white stal­lion. The Califor­nia-born stock horse was part of his care­fully culti­vated war­rior image. A news agency reported that Hirohito made 344 appear­ances on Shirayuki. 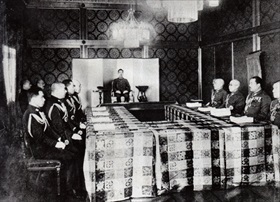 Right: Shōwa Emperor Hirohito, seated in middle, as head of the Impe­rial Gene­ral Head­quarters in 1943. As part of the Supreme War Coun­cil, the Impe­rial Gene­ral Head­quarters coor­di­nated efforts between the Impe­rial Japa­nese Army and Impe­rial Japa­nese Navy during war­time. In terms of func­tion, it was roughly equi­va­lent to the U.S. Joint Chiefs of Staff.